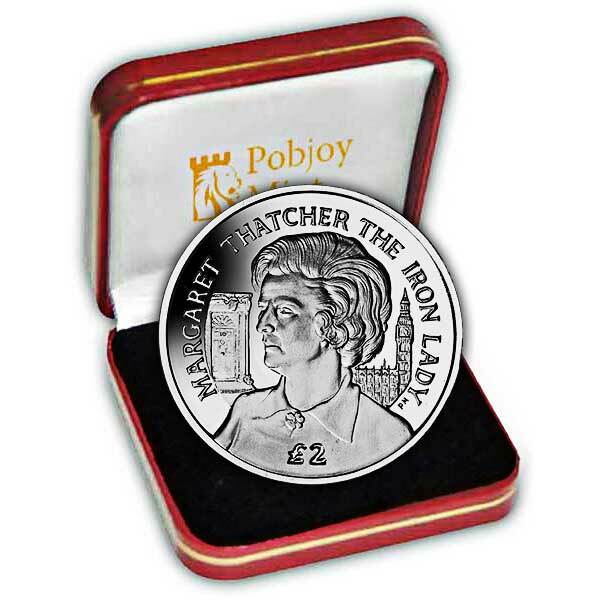 The 2013 Baroness Thatcher - The Iron Lady Coin in Proof Silver and Fine Gold. On 8th April 2013, former British Prime Minister, Baroness Thatcher died at the age of 87. To commemorate the life of this exceptional woman, Pobjoy Mint has released this spectacular coin on behalf of Ascension Island. Called the ‘Iron Lady’, Margaret Thatcher became Britain's first and only female Prime Minister in addition to the longest serving of the 20th Century and was honoured with a ceremonial funeral with full military honours at St Paul's Cathedral, the only political leader to be given such a tribute since Winston Churchill in 1965. Born in 1925, the daughter of a grocer, she studied chemistry but was involved in politics from an early time. She was elected leader of the Conservatives in 1975 and made history four years later on, coming to be Prime Minister when the Conservatives won the elections of 1979, the first of three triumphs under her management. As Prime Minister she took a firm position with the European Community and also on various other issues, both domestic and foreign and hence, changed the nation. The stunning release is a fitting homage to a fantastic lady who, as described by the present British Prime Minister was "a great leader, a great Prime Minister, and a great Briton". The layout on this coin features a picture of Baroness Thatcher with the Houses of Parliament and No. 10 Downing Streer in the background. The obverse of the coin carries an effigy of Her Majesty Queen Elizabeth II by Ian Rank-Broadley FRBS. The coins are available in Cupro Nickel, Proof Sterling Silver and Proof Fine 999.9 Gold. The coins are struck to the greatest quality with the gold and silver versions being produced with a sensational ‘Proof’ surface.